When Peppermint first met Riptide, I wasn’t sure if she would get along with him. In addition to outweighing her by at least four times, Riptide is still a young guy, full of energy and maybe a bit extreme for her recent more conservative tastes in playmates. But from their initial meeting, the two were great pals, and they chased one another around The Hill School fields, romping and playing. Since then, Peppermint has fondly greeted Riptide whenever she sees him, always up for a quick run if time permits or even just an amicable greeting on the leash. Although their photo certainly expresses the Weekly Photo Challenge of Contrast, I’m glad their friendship is very much on the same level. Love it! Peppermint is the cutest little dog! They are so cute! What a delightful pair. I love this photo. Cute dogs! It’s a dog’s life…happy happy happy!!! 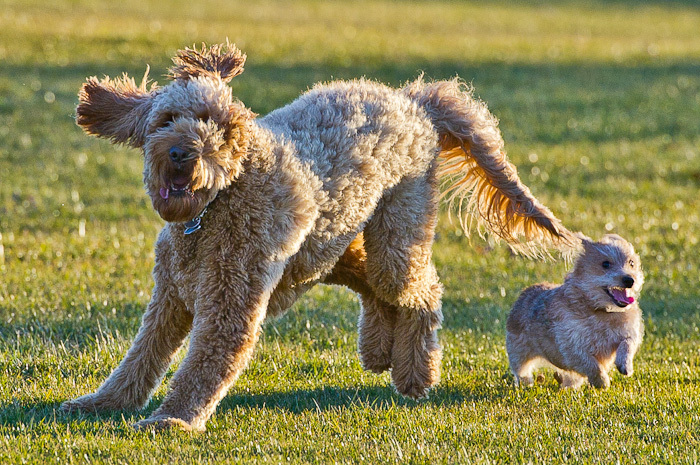 It’s great when dogs have buddies!